This is the Green Garden, for want of a better name... This Euphorbia, I think Wulfenii, has been in for close on three years and has multiplied well - lots of heads 'thickening' up to flower this year! Hooray!!!! Very healthy garden Luzy, that's a great plant so 'full' looking! what colour will the flowers be?? mic wrote: Very healthy garden Luzy, that's a great plant so 'full' looking! what colour will the flowers be?? The flowers will be green, mic, well, the bits that show best. My avatar's one from last season. Nice green garden there Luzy. Looks elegant and soft green colour. Well done. nothing like a bit of 'colour' in the garden, Luzy If I remember I'll try and catch a bit of purple, and post this afternoon. Regardless of how hard I try to avoid doing so, I always seem to end with a purple thing happening! 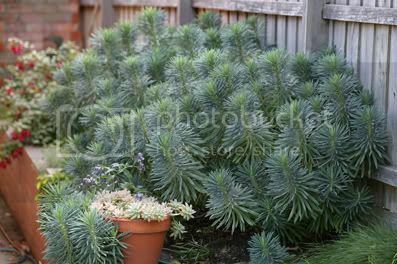 Wow Luzy thats an amazingly healthy looking Euphorbia ....nice pic.You obviously have green thumbs too! Don't know about the green thumb, kitkat. I'm just pleased that they seem to like growing here. I found a photo of that area from about 18 months ago - and am amazed at how they've branched out. It's so nice when a plant does that for you isn't it.My wallflowers have done that for me this year ...they have simply bloomed and bloomed and spread too. Love the silky foliage of the euphorbia! If only they didnt iritate skin so much when the sap comes out.